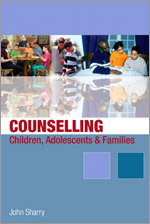 Counselling Children Adolescents and Families is an excellent textbook for all professionals who are seeking a respectful and effective way of engaging and helping children, adolescents and families. Drawing on the best in recent advances in solution-focused and resilience-oriented models of psychotherapy, the book will outline a collaborative approach to therapeutic work that builds on children and families own strengths and resources and that can establish cooperation in even the most difficult situations. Divided into three parts, the book first takes the reader in a clear and straightforward manner through the background and basic principles of the approach, tackling thorny professional issues such as how and when to use diagnosis. Second, the book outlines creative applications such as groupwork with children and parents, using playful and creative activities and using new but highly effective approaches such as video based feedback. The last section, considers how the strengths-based approach applies to ‘difficult’ contexts such as working with child abuse and suicidal teenagers and children.